Clam chowder is my husband’s favorite soup of choice. I’ve tried many, many recipes over the years, some thick as glue and others fairly decent. I have a wonderful recipe for a Quick and Delicious Clam Chowder (can I get a hooray for this soup, Queen B.?) 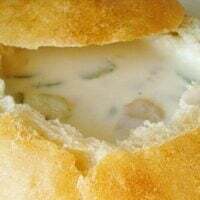 which is light and creamy and a bit soupier than the traditional clam chowder that is thick and hearty enough to stand up to a good bread bowl. Other than the quick recipe noted above, this recipe I’m going to share with you is hands down our favorite classic clam chowder. It originates from my sister-in-law, Erin (contributor to The Sisters Cafe blog) and her mom has been making it for years and years. Can we say tried-and-true? I turn to it every fall when the weather cools down and it never fails to please. Classic, warm, creamy and hearty. This soup is delicious and perfect for the cool weather. Drain the clams and reserve the liquid. In a large pot, place the vegetables and pour the claim juice over the top. Add enough water to barely cover the vegetables. Simmer over medium heat until the vegetables are almost tender (don’t overcook them in this step! ), about 5 minutes. Meanwhile, in a saucepan, melt the butter and add the flour, making a roux with a wire whisk. Constantly stirring, add the half-and-half slowly. Cook and stir until smooth and thickened, without boiling. When slightly thickened, add the roux to the vegetables and add the clams, salt, vinegar and pepper (to taste). Can keep warm (without boiling!) for a up to an hour or serve immediately. What’s the difference between Boston Clam Chowder and New England Clam Chowder? Could u use a favorite wine in place of the wine vinager??? Can u freeze this in single serving sizes??? You could try; because of the high dairy content it doesn’t freeze well as other soups (it’s a little grainy once defrosted and reheated). Just made this for my Boston themed book club and it got rave reviews!! I’m prego and not into fishy things right now but this was to die for… I might or might not have licked the pot. Thanks as always for all the great recipes! Made this tonight and everyone loved it. I have a recipe just like this except for no vinegar, and I thought that it was too rich. The vinegar is a great addition. It adds just the right amount of tartness. Thank you! Made this soup last night, and it was great! I used two cups half and half and two cups of milk. It was delicious, and everybody loved it! Thanks, Mel Your recipies are amazing. I chickened out on the sweet potatoes and held off but I got to the store over the weekend and made it last night with some fish and chips! My husband RAVED! This is my husband’s favorite clam chowder! I want to make it for him tonight but wondered if you think it would still taste good if I use sweet potatoes instead of regular? I’m out and can’t get to the store-my little ones have the flu. Amy – I haven’t tried it but sounds like a good variation! Made this chowder the other night. My family absolutely loved it! I added 2 sprigs of thyme. I am not a clam fan so I didn’t eat it but the recipe was so easy I will make it again for the family! I have made so many recipes from your site and liked almost all of them. 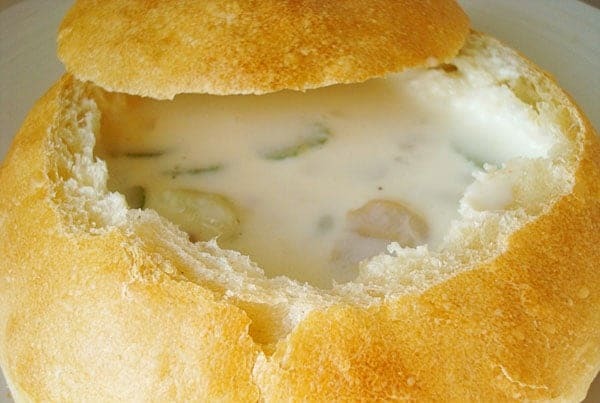 This chowder is on our menu for tonight, using your pretzel rolls as bread bowls. My family always had clam chowder on Christmas Eve when I was young and I’m excited to carry on the tradition with my own family now that I’m a mom. Thanks for your awesome recipes! This was delicious! My husband claimed it’s the best clam chowder he’s ever had (he’s had clam chowder in Boston numerous times). I made it using whole milk instead of half and half to cut down on the fat and calories. It was still very creamy and yummy! Yummy! I cannot thank you enough for this recipe! I am usually not one to leave a review but this deserved it! I couldn’t believe how creamy it was and it totally fulfilled my pregnancy cravings! I am in love with this site! Thanks again! Looking for a good clam chowder to make in a new restaurant. This looks like it may be the one to attempt first,with all the raves!! Quyen – I haven’t tried it but it’s worth a try. I find’ t have any clams this time so I used chicken broth instead of water and added a little sharp cheddar. it tastes awesome both ways!! Umm… this was the best clam chowder I have EVER had and I am a soup fanatic. Well Done!!! Holy moly. This is so good. I shudder to think of the calories I consumed with my 3rds, but totally worth it. Anyone try this with milk instead of half and half? I made this last night for my family along with your Italian bread bowl recipe. Both recipes turned out fantastic! I will be trying many more of your recipes in the future. Thanks! After reading all the rave reviews this chowder got, I decided to ditch my “old faithful” clam chowder recipe and give this one a try. I am so glad I did!! I love how easy this is to make, both in time and in number of ingredients (my other recipe calls for a ton of ingredients, some of them pretty expensive). I love how creamy it is, too. My husband loves clam chowder and said that this was definitely a keeper (seems to be the theme among husbands!). And I’ll also add to the kid testimonial- my 2 year old loved it! Thank you for this recipe! My husband and I added a little twist and threw some carrots in and bought some bread bowls from Panera, this recipe hit the spot!! Siobhan – love the addition of carrots! Glad you loved the soup! I am a beginner at this “made from scratch” stuff. Do I drain the veggies or add the roux into the water veggi mix? Hi Mikki – don’t drain the veggies; add the roux (whisking quickly) to the veggies and liquid. I printed off this recipe over a year ago and finally fixed it for my family tonight. It was absolutely delicious! I will definitely make this over and over again. Thanks for sharing! There is nothing like a thick, warm soup to soothe the soul. I made this last night and served it in sourdough bread bowls. Not only did it look divine, it tasted fantastic! When I make this again, I think I will either double the minced clams or use chopped clams for more clammy goodness in each bite. Thank you! Meredith – glad you loved this one! So good! My 9 year old said it was the best clam chowder he has ever had and he has tried a lot of clam chowder. This will be our only clam chowder recipe from now on! Kelly – high praise from your 9-year old, who seems to be quite the clam chowder aficionado! Wow, so many great reviews. I’m going to try it! Clam Chowder is my favorite!! Although I can’t wait for Fall. It’s summer-time in AZ but this sounds way to yummy, must try it now! Will let you know what we think…. Colleen – thanks! I’m so glad you and your husband liked this soup! This is my first recipe attempt from your site and my husband and I both loved it! I’ll definitely be back! Erin – that's always such a pleasant surprise when everyone loves the meal. I'm glad that this soup was the reason why! Thank you for the recipe. I have never liked clam chowder until now. I wanted to try making it just for my husband. Well, the whole family absolutely loved it. Even my kids, which was a surprise too.. I will be making this again! Dwight – thanks again for your review of this soup. Glad you liked it and that my high praise wasn’t proven wrong. Had to check and see if Kitchen Cafe person exaggerating about how good this clam chowder is. I’m a man, I know nothing about cooking, but I love clam chowder and my wife won’t make it. So I followed directions to the letter and oh my gosh, this clam chowder is good. Have to cut recipe in half next time. Could use a bit more clams. Melissa – wow, that sounds like a great success! Your husband (a clam chowder connoisseur) and your kids ALL loved this. Phew! I’m so relieved! Kelli – thanks for your comment! I’m glad you liked this soup and thought it was easy to prepare…and if your kids are eating it, which it sounds like they are, then that is a success. I made this last night for dinner and it was so good…Easy to make..my teenager even said how quick it was and wow that was fast for such a good meal…!! Thanks for all your great recipes, we love them all!! I made this for my husband for his birthday. Clam Chowder is his favorite soup. He is super picky about the taste so I was a little nervous. He LOVED it!! He said it was one of the best Clam Chowders he had ever had! Thanks for much for making me look so good!! It was so easy too. All my kids loved it and ate it also which is no small feat in my house! Kelly – oh, I loved getting your comment. It makes me wish you would move to WI asap. Glad you liked this soup and the chicken. You are awesome. Leisel – you make me laugh (in a good way!). I’ve never heard of someone loving clam chowder without the clams, but hey, whatever works! So glad you liked this! 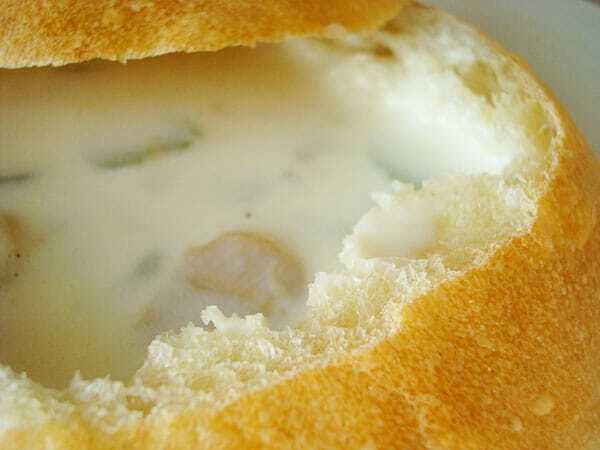 I love the chowder in that bread bowl! I’ve never made clam chowder, I’m bookmarking this! I think clam chowder is one of my favorite all time soups. Believe it or not, but Hooters has great clam chowder!!! Ah!! I love Clam Chowder more than anything! Just without the clams!! I just can’t do it, I don’t know why. But I made it without the clams and added just a pinch of chicken flavoring and it was amazing! I love this recipe, along with all the rest of them!!!! Thank you! gorgeous, it makes me want to go back to san francisco! i love clam chowder! I was thinking with the weather change soup sounds good! I can’t wait to try this! Clam chowder is one of my favorites ever! I’ve never tried Boston style but it sounds so great. I’ll have to bookmark this recipe. I’ll have to try this. I love clam chowder, especially Market Street’s recipe, which is the one I make, but I just might switch things up a bit! I swear I get so excited for “soup season” that we have soup for half the fall/winter! Looks like the perfect meal on a cool fall day. I adore New England Clam Chowder, but haven’t made it at home. This may be the recipe to try! and you KNOW i’m going to try this……….. STANDING OVATION………. for quick and delicious clam chowder !!! !